Halibut is a seafood that we don't have on our menu too often, mostly due to the high price of the fish. However, in an effort to explore new and quality items, we have brought the fish to our menu for a short time. Known for it's extremely low fat content, halibut also has a mild, clean flavor with a dense and firm texture. If you love seafood - or even if you don't - you will probably love halibut. 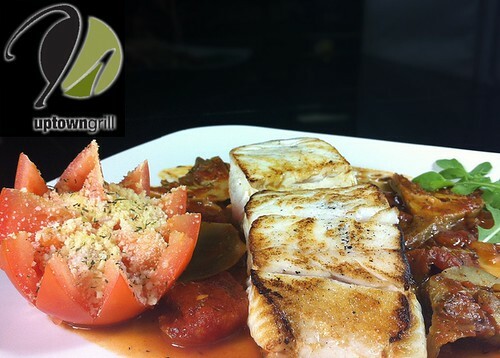 We broil and serve a 10oz halibut over an artichoke tomato sauce with a roasted parmesan tomato crown. Halibut is the largest of the flatfish family. They can grow to be quite large, as much as 730 pounds. A couple interesting things about the halibut have to do with their eyes and their skin color. When they are born, the halibut has an eye on each side of the head. After about six months, one eye migrates to the other side, making them look more like a flounder. During this physical change, their skin tone also changes. The stationary-eyed side of the body turns a darker shade while the other side of the body will remain white. What this does is blend the darker half of the body with the color of the ocean floor and blends the lighter half with the light from the sky above. This type of "camouflage" is called countershading and protects the fish from predators.